Okay, so it�s not Christmas yet but if you�re already exhausted with the preparations for the big day then put your feet up, enjoy a glass of your favourite �tipple� and have a go at this quiz�.30 fiendish little questions to keep you guessing or drive you distracted. To give everyone a fair chance, I won�t be accepting replies until the 10th December onwards which will give you all 3 weeks to beg, borrow or steal the correct answers and for those that get stuck��.clues will be provided! 1. 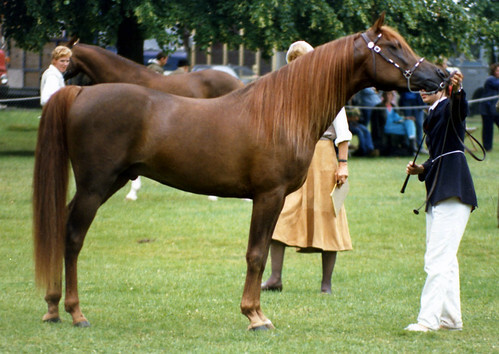 The 2005 British National Champion Junior Male and Senior Female were sired by? 2. �Far are the shades of Arabia, where the Princes ride at noon���..a painting based on this poem was used to illustrate the dust jacket of a book on Arabians - name the book, the author and the artist. 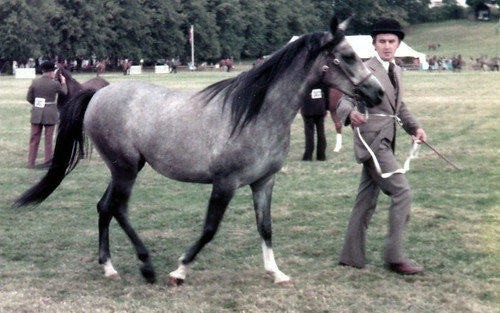 3. Who is the handler and horse shown in this photograph? 4. Lady Wentworth wrote a number of books on horses � how many can you name? 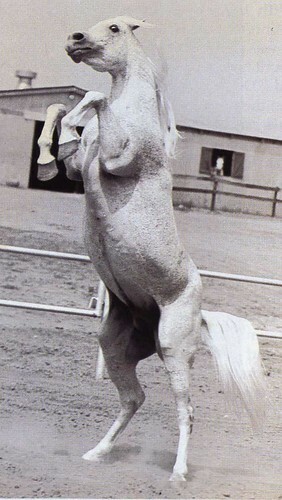 6. Who are the handler and horse shown in this photograph? 7. Who painted this picture? 8. 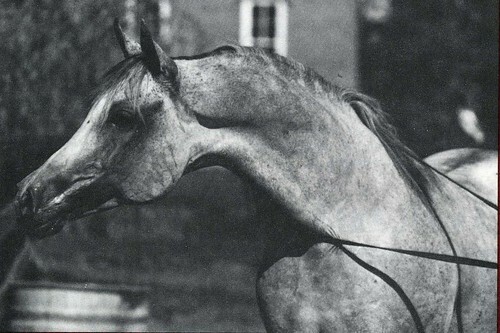 What is the name of Donald and Judith Forbis�s Arabian Stud? 9. Who is the subject of this caricature? 10. What do we associate Jane Llewellyn Ott with? 12. In 1971 an exhibition was held by Diana Wort and Capt. & Mrs. Biggs at their �Chobham Gallery� for an American artist, an example of whose work is shown below. 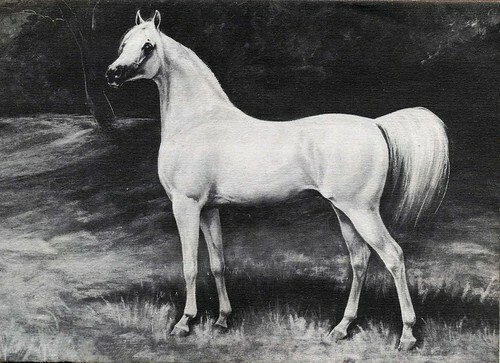 The same artist was later associated with an article published in an American horse magazine which caused such controversy that the magazine folded. Who was the artist? What was the name of the article? Which magazine was it published in? And�.which horse is the subject of her painting below? 13. Lady Anne Blunt�s mother was the subject of a book published in 1999. What was it called and who wrote it? 14. 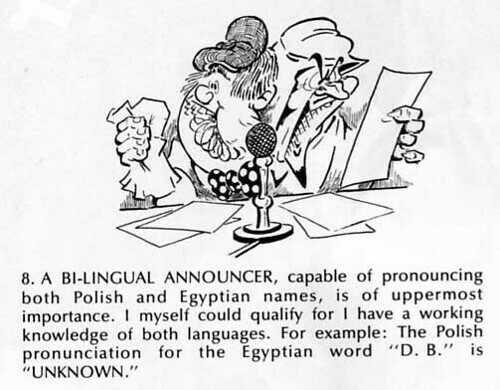 This artist kept us entertained for many years with his wonderful cartoons on the �Arab scene.� The example shown below is from his step-by-step guide for the beginner on �How to put on a local All-Arabian show.� Who was he and which magazine regularly featured his work? 15. 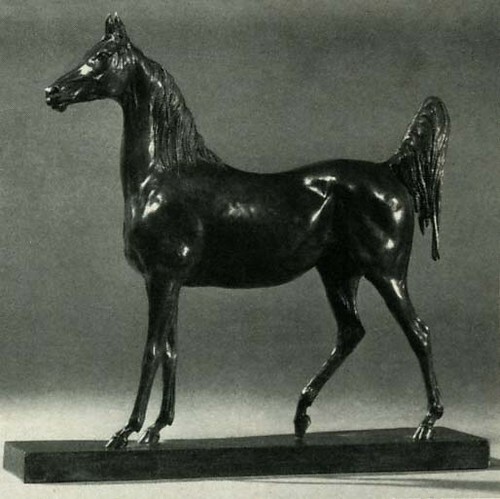 The subject of this lovely bronze was regarded by Peter Upton as �One of the last true desert mares to be imported to this country.� She was indeed a very special mare � who was she and who sculpted the bronze? 16. No prizes for guessing who the subject of the next photograph is! 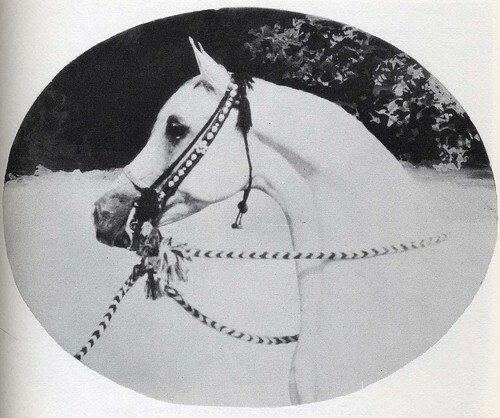 However, the 3 smaller b&w photos show horses who all feature in his pedigree, who are they? 17. Who are the following studs associated with? 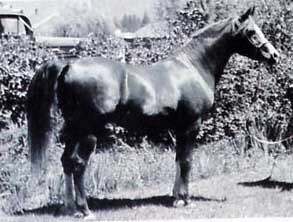 18. Who is this horse? 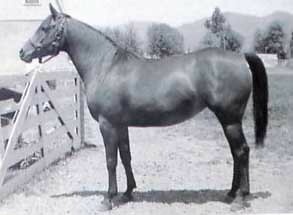 20. Who imported the following horses and in which year? 21. 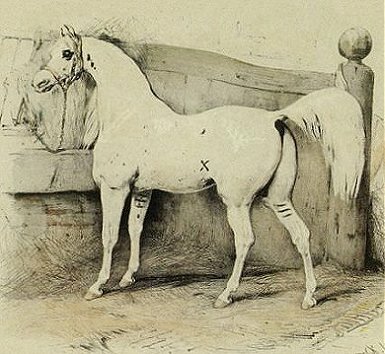 What can you tell me about the horse shown in the photo below? 22. 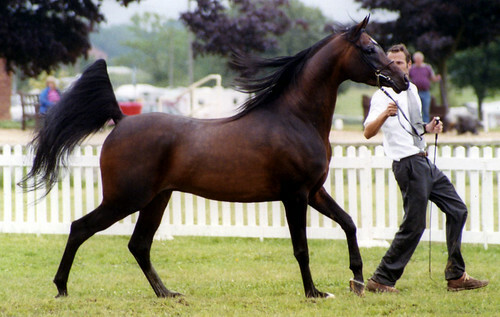 What was the name of the horse who played the �Black Stallion� and who was his sire and dam? 23. 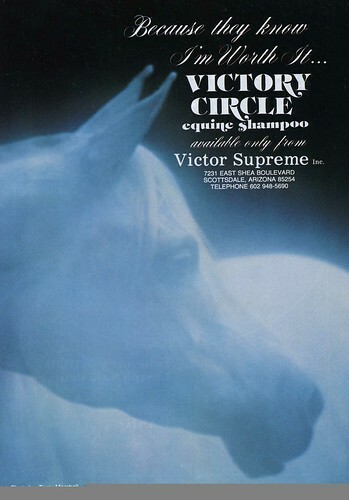 The slogan on this advertisement for Victory Circle Equine Shampoo reads �Because they know I�m worth it� and the subject undoubtedly was�.who was she? 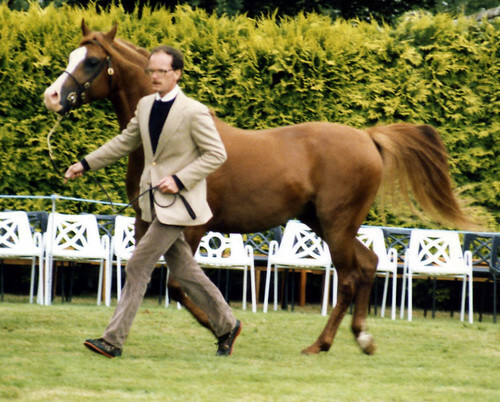 24. Who won the Leading Sire of the Show award at Malvern in 2004? 25. 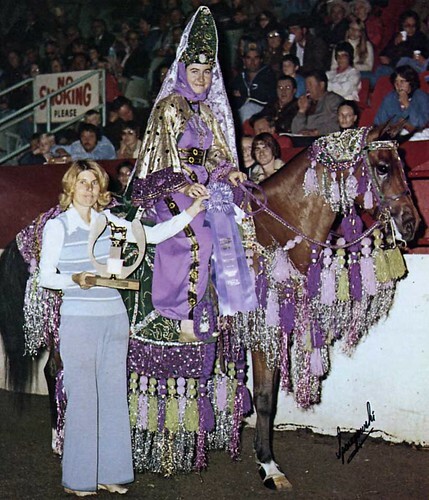 Name the handler and the horse in this photo and what notable win did they achieve? 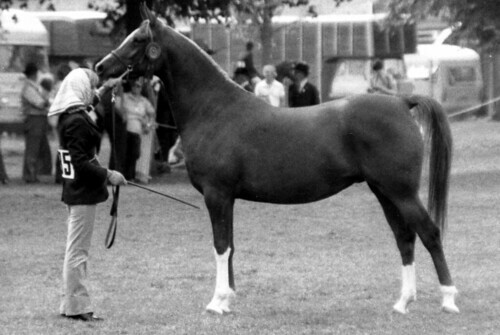 26. Who won the AHS Sire Produce Class at the �Nationals� in 1947, 1957, 1967 and 1977? 27. Who won the AHS Marathon at Thoresby Hall in 2003? 29. Who was the subject of the book �A Pilgrimage of Passion� and who wrote it? 30. And to finish��.a caption contest! What is going on here and what is this poor horse thinking? "And God said to the Wind 'Be thou gathered together.' And the wind was gathered together....And he created from a handful of wind a horse of chestnut colour like gold. And God let loose the Swift Runner, and he went on his way neighing." Caroline, I am very glad to see that you are back and in fine fettle and blimey what a great quiz you have set, wish I had a few good books to help me!! What a marvellous set of questions - well done. We will all, no doubt, be getting "the books" out! opps I just put some replys in and realized we should not put them in yet! so have deleted them , sorry ! Thank you all for your kind replies, I�m so relieved that you like the quiz! Must admit I was a bit worried when I posted it but as Jude said, most of the answers can be found in old books, magazines or the Internet or�.you can always �phone a friend�! Yes, Bob, I thought you�d know all the answers but the trick is to be the first to post them on the 10th so that means staying up till the wee hours won�t it!? PS Barb � hope the Muscovys are well! HI Caroline, so it will all be down to who gets up the earliest or stays up the latest on the 10th?, so all the swotting could be for nothing for those that didnt get there in time? so be it! although I am not a late owl or an early bird . Caroline, Mike and I decided late into the summer, that we three should set some sort of a quiz for those lonely, quite moments people sometimes have at Xmas you know what I mean to that end Caroline will post 30 questions, on one thread, Mike will post 30 questions on another thread and I god bless me will post 30 questions on yet another thread. Mine will be 10 on Spanish, 10 on Polish and 10 on Russian. I think Mike will plumb for Se This is not a race, take your time and only post to the thread that holds the questions you want to answer. To recap, Caroline thread is for Caroline, Mike�s thread is for Mike. Bob, great to hear that you and Mike will be posting your own quizzes soon too! I�m looking forward to trying to answer some of your puzzles but knowing you two �it ain�t gonna be easy�! Lynda, as Bob explained this is not a race and no, the winner is not whoever posts the earliest on the 10th � I was only teasing Uncle Bob about this cos he said he knew all the answers! I thought a space of three weeks to research the questions would give everyone an even chance. Of course there is an element of who posts the right answer first but this already happens in our other quizzes and I don�t know a way round this unless you can suggest an alternative? Like Bob, my quiz will close on the 31/12/2005 so that�s lots of time for everyone and remember���������..have fun! Nah Lyndiloo, IMO, all answers have to be on line !! Caroline, can a team aka several people get together, be called by a name for the team with the answers then submitted by one person at 12.01 on the 10th? What fun!! 1) All answers must be posted on the website. 2) Answers for this quiz should be from individuals only. 3) Everyone should follow the same form for answering the questions i.e. 4) Remember the rules from the �Test Your Knowledge� thread which apply here too - no �is it�, �could it be�, �I think it�s� etc. 5) Answers should be posted on the 10th December from 8:00 am onwards. 6) I will start to �mark� your replies one week later starting on the 17th December (so I can keep track!) The final closing date is 31/12/2005 which should give you time to think carefully about your answers. 7) Remember this is not a race; the winner will be the person who supplies the greatest number of correct answers. 8) In the event of a tie, a �tie breaker� question will be posted. Good luck with your research but most of all � have fun! However you yourself suggested (on the 23rd ) that all the answers should be sent direct to myself and that I could then �check them fairly and post the winner on line afterwards� which is basically the same thing. I decided against this as I didn�t want any accusations of unfairness or favouritism - by posting them online everyone gets a fair chance. I�d hoped that this quiz would be both fun and educational which is something that Bob and I both feel very strongly about � you can never stop learning about our wonderful breed. This will in any case be the last quiz or puzzle that I�ll be posting on Arabian Lines as I unfortunately won�t have the time in the future. Keep going, we enjoy your questions. Horse quizzes shouldn�t be easy and by their very nature can�t be, or else we could just go down to the pub to a quiz night! I am definitely entering though I don�t think I�ll do well which is why I wanted to be on a team called �Goldies but Dusties�, qualifying age to be on the team is over 55 . Yea, of course I know some of the answers but I have a long way to go to answer them all. And �Goldies but Dusties� get extra points for every year they are over 55 � my added rules Caroline . Please don�t leave us Caroline though I will be seeing you very soon out here � but no quizzes please when you come, my senior brain wouldn�t be able to take it as well as all our chat on our stud and museum visits, Persian carpet and antique looking, heritage investigation, shopping, etc, etc. Had an invite today to go sea fishing with lines in the Arabian Gulf so that's something else to add to our 'to-do' list. You see folks, this is really why CJ will be busy !! I prob will not manage many but will def have a go. PLEASE I beg you to keep them coming - brain cells need motivation occasionally.